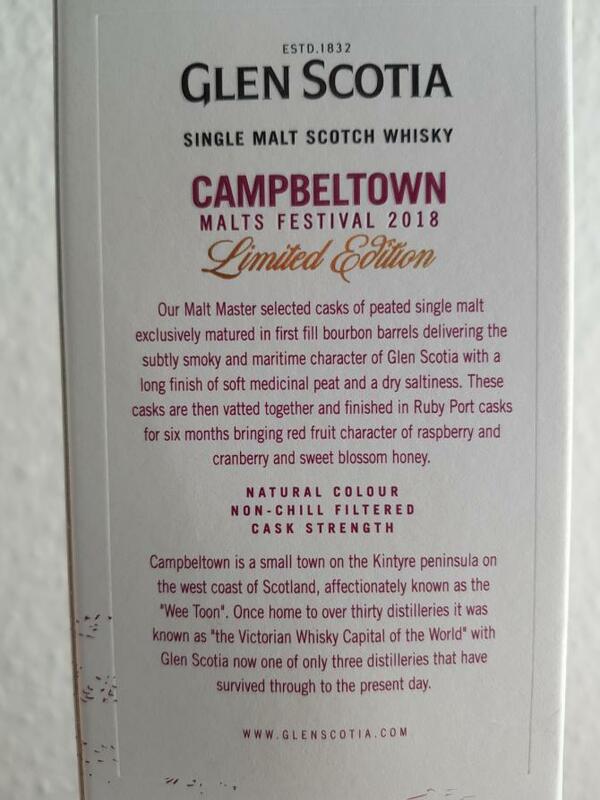 Campbeltown, 10 years, Port Finish, cask strength for 50 € ??? And then he also tastes awesome? Terrific. Conclusion: great, cheaper whisky! Intense, interesting, tasty. 89 points! A price-performance miracle. If you include the price, he shoots well over the 90! Smoke. Fruity, berry smoke. Smoking strawberry. Behind it nutty chocolate. The alcohol intensifies the nose, but does not bother. Earthy peat flavors are there. Blackberries. Nutmeg and mint. After a few moments oak comes through. Spicy, but subtle. Wet grass. Water: creamy. Spicy-sweet. Hay. The chocolate gets a little darker. Something Physalis comes to it. Vinous leather comes with time. And it is getting fruity. Sweet start. Ripe strawberries and melon. The smoke is restrained. Raspberries. Warm and juicy, the entire mouth is filled. Some sweet and sour grapefruit. By swallowing the smoke comes through a little stronger. Occupies the oral cavity. Make him dry. Dry-smoky dessert. Water: Incredibly tasty. A little less sweet. Smoky bittersweet chocolate, 70% cocoa content. A trace smokier. Finish: Long, slightly warming. Great fruit-smoke combination remains long. Initially juicy sweet, it gets drier quickly. With water comes a very slight bitterness in the finish. Long, slightly warm. Great fruit-smoke combination remains long. Initially juicy sweet, it gets drier quickly. With water comes a very slight bitterness in the finish. An intense interplay of slightly medical smoke, freshly cut vanilla pods, maritime notes (salt) and plenty of strawberries is immediately present. The high-potency alcohol (57.8%) is very well integrated, only at the beginning was a slight stinging perceptible during deeper breaths. Tart redcurrants and ripe raspberries are a nice complement to the sweet strawberries. Salty caramel sweets, honey and delicate hints of wood round off the beautiful nose. I can not remember spontaneously that I had such a flavor composition so far in the glass. High recognition value! There is a lot of steam in the kettle here. At the first sip it tingles neatly at the tip of the tongue. Sweet-spicy smoke spreads suddenly with freshly ground pepper throughout the mouth. Strawberries, ripe raspberries, red currants and a few unripe cherries cement a beautiful fruit foundation. The smoke is still medicated and rich in mineral-maritime notes that remind me primarily of salt. The spicy woody notes are more pronounced in taste, but always remain pleasantly balanced. With the help of a few drops of water, the red fruit notes and the vanilla sweetness intensify significantly. The spicy notes are a little muted. Finally, I discover a touch of milk chocolate in the background. Medium to long, sweet and spicy and smoky. The medicinal smoke envelops the red fruits and the vanilla residual sweetness. 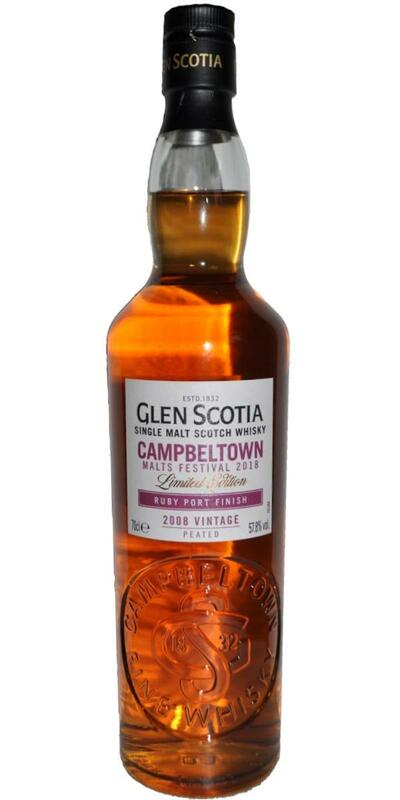 Salty caramel sweets, a hint of honey, milk chocolate and harmonious-spicy oak notes make the Glen Scotia slowly fade away. [June, 2018] I had this dram during this year's "Feis Ile" tasting session. The colour is yellow gold and the texture shows small tears with medium fast legs. The nose is quite punchy due to the high alcohols and offers a fruity-buttery-nutty profile that is not too bad at all. It is not overly complex but fresh and balanced without any off-note. 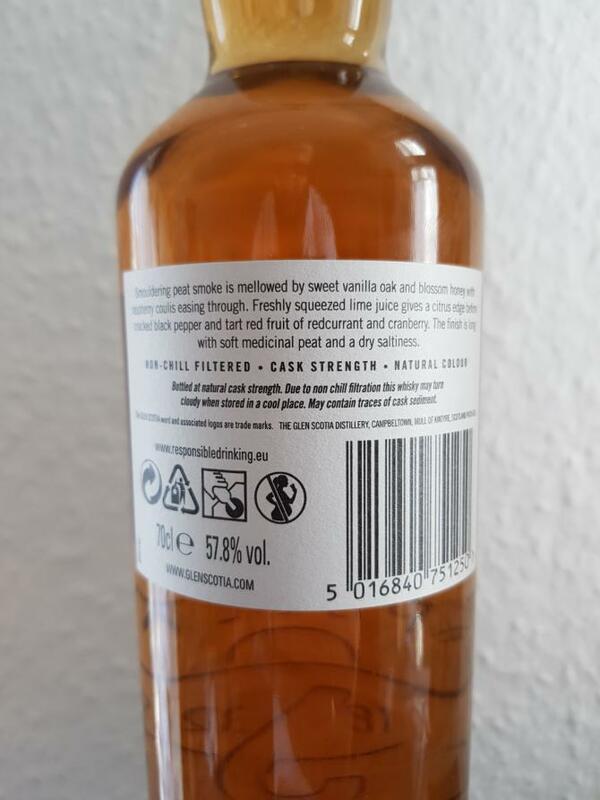 The whisky arrives a little hot in the mouth (no wonder at that abv) with just a neglectable coating effect and a minor drying-astringent feeling. The taste is rather shy first but after some chewing (and dilution in the mouth) it offers nice fruity and spicy (hot chilis, peppers, some salt) flavours - but where is the peat? It is almost impossible to detect both in the nose and on the palate. And the port wine lurks very shy in the background, so I never ever would call this a "peated and port wine finished" whisky (in a blind setting). Nonetheless, it is easy to sip and enjoyable. The finish is of a medium length and offers more spices with some sour (port?) wine flavours finally. Unfortunately it dries out at the end (on papers and plastics). Water releases the sour wine aromas in the nose as well and turns the taste more approachable but it increases the dryness of the finish too. Actually, I prefer the neat dram even at the high abv of 57.8%. click for the 2018 festival! a very good dram discovery! Aroma: in the foreground freshness, menthol, iodine, sea breeze, further mineral-metallic notes - whetstone, lime, metal chips; various berries, red and black currants, ripe cherries, sour apples, vanilla. A little in the background extinguished fire, ash, smoke from flavored tobacco, dry wood, pine resin. Taste: sweet-sour, spicy, red pepper, cumin, wood tannins, sweet berry jam, burnt crust of Borodino bread, espresso, smoked meat, fish oil. Finish: longer than average, bittersweet, berry jam, highly mineralized min. water, chalk, a little sulfur-metallic shades. Bottom line: and once again a great campbell camper! 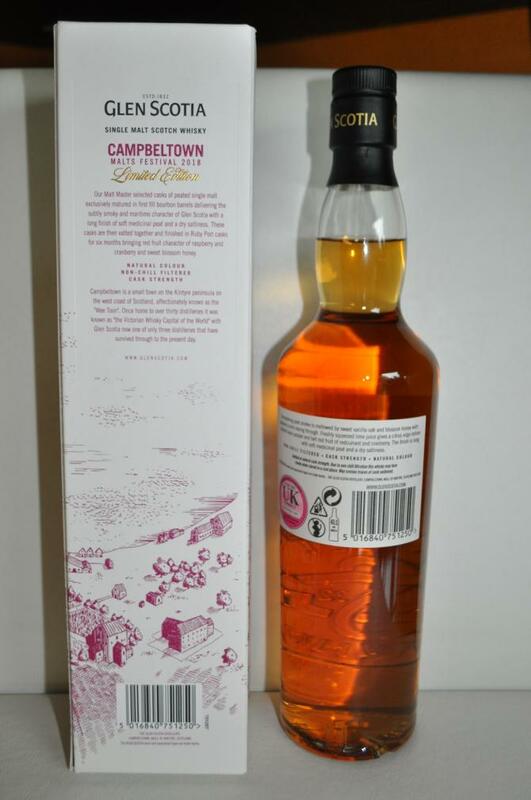 The wonderful combination of the coastal nature of Campbeltown, which I love so much, with the fruit and berry finish of the port barrel, are all separate and separate, but a very good picture goes together. Another important fact is the price, € 50 for a 10-year-old molt barrel fortress and even such quality is a gift! He did not like water without me. He opens with water. He becomes more fruity. However, I always have such a disturbing disinfectant grade that I do not like at all.